Born in Jersey, Daryl had started his career at Grimsby Town, with loan spells at Northampton Town and Cheltenham Town, along with Republic of Ireland Under 21 appearances. In the summer of 2001, he signed for Boston United and began his prolific scoring form, gaining the Conference Golden Boot in the 2001/2002 season. After Boston’s promotion to the Football League, he moved to Chester City for two season and once again, won the Golden Boot award in helping Chester achieve Football League status. 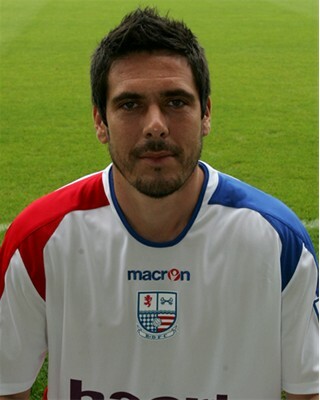 In November 2004, Daryl returned to Boston United, before a move to Crawley Town the following season for an undisclosed five figure deal, which was reported to be a club record at the time. Financial problems with the Red Devils led to his release in March 2006, and he joined Burton Albion. He impressed during his time at the Brewers, with his goals propelling them towards the Blue Square Premier playoffs at the end of the 2007/2008 season. 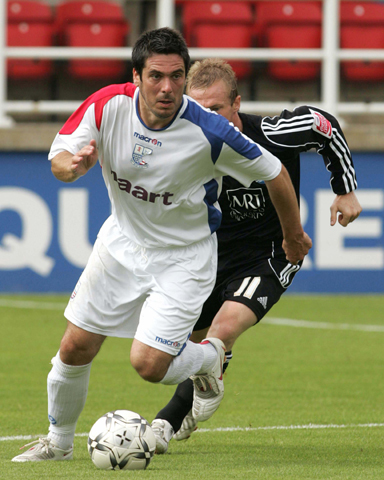 Daryl arrived at Nene Park on 15 May 2008, signing a two year deal after rejecting a new offer with the Brewers. He made made his first senior appearance for Diamonds as they beat League 1 Peterborough United to win the NFA Maunsell Cup Final on 26 July 2008. He narrowly missed scoring on his debut when he had a goal ruled out for offside. He had earlier scored for the club in a friendly against Portimonense SC in the Algarve – a goal that will be long remembered by those who witnessed it. In the pre-season friendly against an Arsenal XI however, he suffered a broken jaw which meant he would miss the start of the league season. He was finally able to make his Conference debut on 11 September 2008 at Lewes, and he scored the opening goal in that game. After a brief period of first team football in which he quickly became the Diamonds top scorer, his season was once again disrupted by both injury and off-field issues. After being away from the game for some time, he was loaned out to Mansfield Town on 20 March 2009 for the remainder of the season, before signing permanently on 22 May 2009. Following just three starts and several substitute appearances however, he went out on a three month loan to fellow Conference side Gateshead on 16 October 2009, before joining them permanently on 8 January 2010. He joined Cambridge United on 30 June 2010 on a two-year deal after an agreed £10,000 transfer fee. On 24 February 2011, he went on a one month loan to Conference North side Alfreton Town, which was later extended until the end of the season. On 10 August 2011, Daryl went on a one month loan deal to Conference North side Gainsborough Trinity, but plans to make a permanent move failed, and he returned to Cambridge United. On 22 September 2011, his contract was cancelled by mutual consent and he spent the time to obtain a Sports Science degree, and a Level 2 coaching badge. On 17 June 2012, Daryl was appointed Player/Manager of NCEL Division One side Louth Town, but after 16 months in charge, and just three wins from their opening 15 fixtures at the start of the 2013/2014 season, Daryl agreed to step down by mutual consent on 29 October 2013. The following month on the 28 November 2013, Daryl joined UCL Premier side Boston Town in a player/coach role. Following the departure of assistant boss Andy Liddell, Daryl was appointed player/assistant manager in June 2014. He stepped down in mid-September 2014, due to personal reasons. He took up a role as a Football Coach at the Grimsby Institute.